Research papers are cited and available for download at the conclusion of this article. In 2009, the National Football League (NFL) instituted its concussion protocol (Stites). Since then, researchers have invested countless hours conducting neurologic studies. These studies have made the public more aware of the long-term consequences associated with head trauma and have influenced the NFL to update the concussion protocol with the aim to help protect its athletes from long-term head injuries. Although the vast majority of us will never become professionals in a contact sport, athletes playing at the amateur level (childhood, through adolescence, and into adulthood) are also susceptible to cranial (head), facial, and oral (mouth) injuries. Fiscally, orofacial (mouth and face) injuries from sports-related activities are estimated to cost ~$1.8 billion each year (Altschuler)… And, the most common orofacial injuries from athletics are those involving the teeth! In fact, a 1995 study showed that over 5 million teeth are avulsed (dislodged from their bony housing) annually (Gutman). From an emotional standpoint, orofacial and dental injuries can cause problems that money alone cannot fix. Statistically, published results have shown that up to one-third (~33%) of dental-related injuries will occur during sporting events, (Giglio, Altschuler) and it is estimated that athletes neglecting to wear a mouthguard are ~60 times more likely to sustain a dental-related injury (Vatardis, quality dentistry website). These numbers may make you question if you should even consider playing…but remember there are countless athletes among us who will (at some point during life) play for love of the game! While some athletes may opt to not participate in contact sports, those of us who choose to play should (at a minimum) know which options are available to help minimize the risks of head, face, and mouth-related injuries. To summarize (or to put it in a nutshull)…The best preventive habit, to minimize the risk of head- & mouth-related injuries, is to wear properly fitting athletic equipment! A well-fitted helmet protects the head and brain, a facemask protects the facial structures (eyes, nose, jaw, and skin), and a mouthguard SHOULD protect the teeth and gums (Giglio). The NFHS (the equivalent to the NCAA for high school athletics) mandates that players be equipped with proper protective equipment. Sizing guides and sales people are available to inform players about which helmets best suit their needs; however, less information is readily available regarding mouthguards. So which mouthguard is the right choice for you? That answer is contingent upon your age, dental development, and desired level of protection. Currently, the available mouthguard options are categorized into three (3) main types: stock, self-adapting (aka “boil & bite), and custom-made (Altschuler, Giglio, Mantri). While, the NFHS mouthguard requirement does not dictate which type of mouthguard an athlete must use, the organization does mandate that it be a visible color (other than white). So unless you are a wrestler, a clear mouthguard does NOT meet NFHS requirements and a white colored mouthguard is not permissible for any NFHS sanctioned sport (NFHS position paper). Club sports often use a high school’s name, but may have different interpretations of the rules so inquire with your organization on its particular mouthguard rules. Stock mouthguards can be purchased at sporting good stores usually for < $25 and are available in standard sizes (small, medium, large), Athletes MUST retain this style in the mouth by biting into its rubbery material. Due to the fact this style guard is prefabricated, they cannot be altered to better fit your mouth. While they may be the most attractive to you book, understand there inexpensive price tag will offer the least amount of protection. However, this style is often the most comfortable fit for athletes undergoing orthodontic treatment because the mouthguard will fit over braces. Another frequently purchased mouthguard style is the group that has self-adapting capabilities, commonly referred to as “boil & bite” mouthguards. They come prefabricated from a manufacturer, their composition allows their shape to be altered to better your mouth . This style can be purchased in many sporting goods stores or online (typically for less than $50). 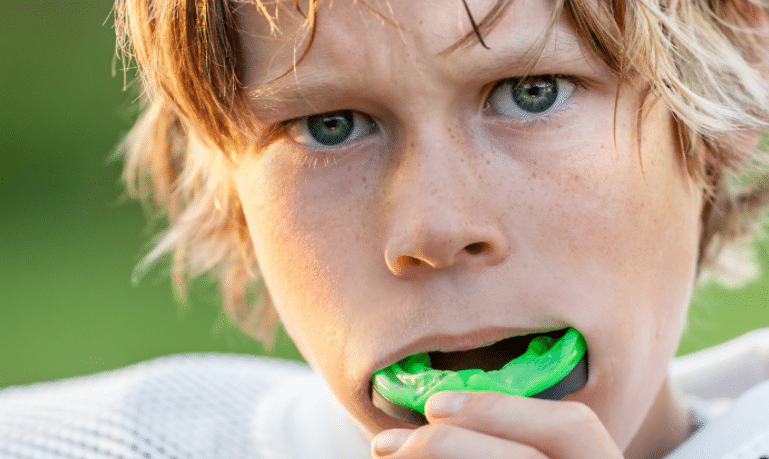 While this mouthguard is not the ideal option for athletes who have completed their dental growth, they may offer the most economical option for elementary-school, pre-teen, and middle school athletes. This age group, whose mouths are not fully developed, often have a mixture of primary (“baby”) & secondary (“adult”) teeth. Like stock guards, “boil & bite” mouthguards are retained in the mouth by occlusal pressure from the user. Newer versions of self-adapting mouthguards are available in flavors and some even offer a limited dental warranty of over $30,000 (Bite Tech Custom Dental Warranty – UnderArmour). Always review the fine print if a warranty is offered because several exclusions will apply (including…but not limited to… teeth with pre-existing dental work, mouthguards that are not properly formed to the user’s mouth, and the injury must occur during a coach- or official-supervised sporting activity and be properly documented). Lastly, there are custom-made mouthguards that are best suited for athletes who are involved in contact sports, have lost all of their baby (primary) teeth, and have completed any orthodontic treatment. When compared to the other options, a custom guard will carry the largest price tag, but in exchange offers the best protection and the most comfortable fit in the mouth. The term “custom mouthguard” originates from the process by which it is fabricated. An impression is made of the user’s mouth and a cast is poured to replicate the mouth’s anatomy. Next, specialized dental equipment is used to adapt the mouthguard’s thermoplastic material to the replica cast. These steps are critical to allow the mouthguard to specifically and comfortably fit your mouth. Unlike the other types, a custom mouthguard is retained by the shape of the teeth which allows athletes to speak with it in place. This feature is popular among those playing football (especially quarterbacks), hockey, rugby, softball, lacrosse, and basketball. Mouthguard styles are a personal choice, what is preferred by one player may not be the preference of another player. The information above is intended to help you make an educated decision. Although the research does not demonstrate that a mouthguard will prevent concussions (Daneshevar), research does show reduction in orofacial injury severity (Ramagoni, Vastardis). Remember, the American Dental Association (ADA), several dental specialty organizations, and athletic governing bodies ALL support the use of a mouthguard to protect YOUR oral health. Which mouthguard is right for you?